Bike for show and run for dough. A poor run rarely leads to a good race overall. And yet, so many triathletes struggle mightily with running well off the bike. Today you'll learn the 5 keys to having a great run off the bike in your next race, and most races after that. The 5 keys to running well off the bike! How much slower should your triathlon run splits be compared to open running races? Is your cadence on the bike important for running performance? How to pace your triathlon runs for different race distances. The science of running well well off the bike. What really happens when you run off the bike? Why do you go not as fast as you’d like to in your triathlon runs compared to your open runs? Running economy is another factor. And again general fatigue affects this. Aspects like core temperature also have a big part to play. If you already have an elevated core temperature, it will cause you to not get as much from the energy that you get in that you produce from your oxygen to what you get out from your running. One study on this is by Millet and Vleck in British Journal of Sports Medicine found that the increase in the energy cost of running varies from 1.6% to 11.6% and is a reflection of triathlete ability level. At the very high end, the reduced economy is very low – 1.6%. But when your abilities decrease when moving towards the back of the pack, then it increases to 11.6%. This study also found that most biomechanical parameters are unchanged. The forward leaning trunk is the most common issue. What you should do reduce the reduction in economy and run better off the bike? You have to practice. When you get closer to your racing season, maybe 2 months out at the latest, you have to practice doing brick workouts at least weekly. It doesn’t hurt to do it twice a week depending on how often you train. Make your brick workout race-specific. Not every single one of them have to, but a lot of them should have race intensity on the bike, whether it’s a continuous race intensity effort or intervals. And the run should also include race specific intensity in that brick run. You can start with something as simple as e.g. 5 minutes at race pace and then pulling back to a little bit (or a lot) slower than race pace just to make sure that you don’t get yourself overly fatigued if you do a lot of training. You can’t do every single brick workout an all out time trial. But you need to include some race intensity to practice and teach your body how to handle that stress, because it’s very different running off a hard bike than running off a very easy recovery ride. A 10-20 minute brick run will give you plenty of stimulus, but for some people it may be useful to do longer bricks. 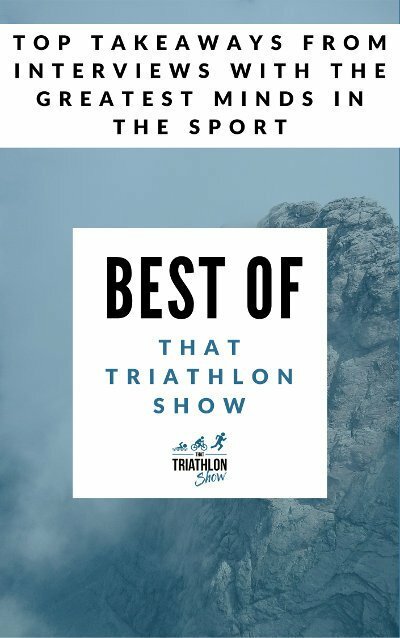 This is something that we talked about in Episode ﻿﻿19 - Improve your triathlon running and give duathlons a go with Eric Schwartz. He gave the advice that doing long brick runs is useful. This is something that you can consider trying out as well. My personal preference is doing it shorter – 10-20 minutes or 30 minutes for the very longest. You should know what you can realistically sustain for the run and have a plan on how to make sure that you don’t run too fast at the start, only to then fade away or even start walking. Especially if it’s a long course race. There are 2 studies in triathlon that have shown that negative splits (running the second part of a raace faster than the first part) in the run portion of the triathlon produce faster performances in both elite triathletes (le Meur 2011) in well-trained amateurs (Hausswirth 2010). This is something that everyone should shoot for, even though these studies have been done with really well-trained triathletes. It's maybe even more important for beginners, because they don’t necessarily have the same perception of pace, and may do way too much of a positive split and then really slow down on the second half. Start conservatively and if at an appropriate point into your race you feel that you have it in you to push it, then just go for it. You will feel this and having trained for it really helps you know the right time for when to really push it. Zone 4 or 5 for intermediate and advanced triathletes. An intensity factor higher than 1 if you use TrainingPeaks. So that’s higher than your functional threshold if you’re a pretty quick runner. Closer to 1 if you’re more intermediate. Beginners: 5-6% slower than your open 5k time. For example, if your open 5k time is 20 minutes, then 21 minutes would be the result of 5% difference. This could be what you aim for in your triathlon 5k. For less fit athletes, the differences might be a bit bigger – maybe 7-8%. The point is that you shouldn’t let the differential become too big because that would mean that you are severely under-trained or you have gone too hard on the bike. Again 5-6% slower than your open 10k run if you’re relatively well trained. This means that if you’re a 40-minute open 10k runner, then 42 minutes would be a good time to shoot for. To give an example of pacing here, if you’re running at a 7-minute mile pace then you should add 21 seconds per mile for this with a 5% difference. In kilometer pace (these are not exact equivalents - I just picked random paces), if you’re running a 4:30 kilometer pace then add 13 seconds per kilometer. Beginners: stay conservative - high Z2 to Z3 might be more sustainable, or looking at that 7-8% difference compared to an open 10k. For beginners, decrease this to 0.88 or lower. And again, it’s really important here to consider doing a negative split and to start conservatively. A 6-10% differential would be a good guideline in terms of percentage differences compared to open half marathons. An example here would be if you run a 1 hour 40 minute open half marathon, then if you had an 8% differential, you would run at 1 hour 48 minutes in your 70.3 race. Beginners are definitely limited to Zone 2 or even Zone 1. Maybe even insert regular walking breaks of about 30 seconds at regular intervals (practice this in training!). But when you really feel certain you'll finish strong, then you can increase your pace a bit. But again, start conservatively and then re-evaluate at the halfway point or maybe even later. Remember that a marathon really starts at 30k. For advanced athletes, Zone 3 is probably possible to hold but towards the lower end or around your aerobic threshold. For percentage guidelines, a 15% differential compared to an open marathon would be a reasonable target for the average age-grouper. It has been proven many times by research that you can’t really improve your running economy or your run pace by doing too many active interventions to change your running form. This isn’t to say that you shouldn’t work on your running form. But I always want to be careful with dishing out advice on running form. One main point that I want to bring across when running off the bike is that many lean forward too much at the waist. One thing that I do regularly is I try to run past a place where I have big windows on the side of the road. So I can look at my profile in those windows when I'm running just after coming off the bike. This will help me determine if I’m leaning forward too much, or if I'm running tall and upright. This is my mantra: run tall. Another point is just to stay relaxed. Don’t tense up. This is common to happen in your upper body – your shoulders, arms, and upper back. Try to shake out your hands by letting them hang by your side for a short while. For running cadence(stride rate), what happens if you have too low cadence is that you tend to overstride, which is inefficient. Try to keep your cadence up. This means whatever is high to you, relatively speaking. You just can’t go straight from 170 steps per minute to 190 if you’re accustomed to running at 170. When you want to have a good performance, you need to have a good run performance as well and this means that you just can’t overcook yourself on the bike. This is something that happens pretty often among age-groupers, so I want to really emphasize this point. It’s okay to have a 2-3 minute slower bike split than normal if that allows you to have a much better run split that compensates more than that slower bike split. If you've done your energy intake and hydration right on the bike, then you’ll have a greater chance of having a good run​. Of course, you need to keep on top of it during the run as well, but the bike is probably a bigger deal-breaker in this regard. The next episode, Episode 49 will be on hydration and sodium. I found three studies on the topic. All of these studies used three different cadences – a preferred cadence, a high cadence (15-20% higher), low cadence (15-20% lower). Two of them (by Bernard in 2005 and T﻿ew﻿ in 2005) found no difference in running performance if you have a higher or lower bike cadence. However, during the first 500 meters of the run, the participants ran faster and had a higher stride rate on the run if they did not use a low cadence. This might have some benefits. I don’t think it hurts your run to have a higher bike cadence, but the question is, does it make you slower on the bike? This is where practice comes in again. You need to see what works for you. Don’t take any single cadence or any advice on cadence at face value. The third study had a 30-minute high intensity cycling effort (at preferred cadence and also at 20% faster and 20% slower), followed by a 3200 meter run time trial. They did find an improved performance on the run with the normal and high cadence compared to the slow cadence. Running cadence was also significantly higher after normal or high bike cadence compared to slow cadence. This study was done by Gottschall and Palmer. I don’t think that you can really say anything about whether a certain cadence is good or bad for your run based on the available evidence. But you should practice, practice, practice, and see what works for you. This will help you on the run, period. You won't be as impacted by a hard effort on the bike in the run segment if your fitness is higher, even if the relative bike intensity was the same. They found that a steeper seat-tube angle leads to a more relaxed hip angle. They compared two different angles for the seat-tube: 73° and 81°. The participants completed a 40 kilometer high intensity bike effort, followed by a 10 km treadmill time trial for the run. They found that the steeper seat-tube angle led to a significantly faster run compared to the 73° seat tube. The improvements in performance were most prominent during the first 5km on the run. The 10k-results were 42:55 on average for the steep seat-tube angle, and 46:15 on average for the smaller seat-tube angle. In the second half of the time trial, the differences were much smaller and not statistically significant. No differences in physiological variables were noted although heart rate, stride length, and stride frequency were increased after the 81° condition. All tri-bikes will have a steep seat-tube angle already. Millet and Vleck: Physiological and biomechanical adaptations to the cycle to run transition in Olympic triathlon: review and practical recommendations for training. Le Meur et al: Relationships between triathlon performance and pacing strategy during the run in an international competition. Hausswirth et al: Pacing strategy during the initial phase of the run in triathlon: influence on overall performance. Gottschall and Palmer: The﻿﻿ acute effects of prior cycling cadence on running performance and kinematics. Garside and Doran: Effects of bicycle frame ergonomics on triathlon 10-km running performance.